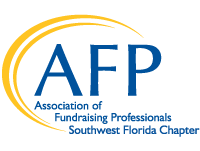 AFP is an individual membership association advancing philanthropy through education, training and advocacy based on research, a code of ethical principles and standards of professional practice. Recognized as a Ten Star Chapter for its stellar programming, our Southwest Florida Chapter is ready to meet the diverse needs of its membership. Please call our Chapter Administrator, Kim Noyes at (941) 921-5410 or contact her at kim.afpswfl@gmail.com if you would like to get involved! The Southwest Florida Chapter is committed to growing professionalism and diversity among its membership, increasing the opportunities and resources provided to our members, and celebrating the philanthropic heritage of the Sarasota/Manatee Community.